John Mead was born in Crewkerne in 1797 and baptised on 29 January 1797 at St Bartholomew's church, Crewkerne. He was the son of Samuel and Susannah Mead and had at least two younger siblings; Samuel (b1798) and Ratchel (b1802). Nothing is known of his early life, but he married a girl named Ann. They lived in Vicarage Street and John worked as a brazier. John and Ann had at least one child, Edward, who was born in Yeovil in 1825 and baptised at St John's church on 29 September 1825. John was recorded in the Churchwardens' Accounts every year from 1835 to 1850 as a brazier (an artisan who worked in brass) and from 1852 to 1856 as a tinman (a merchant who sold tinware, also sometimes confused with tinsmith, a metalworker who made or repaired tinware). Although we don't know exactly what John did for the Churchwardens, his annual bill for 1837 was £1 12s 6d (around £140 at today's value) and in 1838 it was £2 10s 6d (around £218 at today's value). The Somerset Gazette Directory of 1840 listed John as a 'Brazier & Tinman of Vicarage Street', as did Hunt & Co's Directory of 1851. However, despite searches, I could not find John in the 1841 census, and he certainly wasn't listed as living in Vicarage Street. Ann died in the spring of 1849 and later that year John married Elizabeth Stacey (b1895, Horsington) at Yeovil. In the 1851 census John and Elizabeth, together with John's son Edward from his first marriage and a domestic servant, were all listed living in Vicarage Street. Both 54-year old John and 25-year old Edward described their occupations as tinman. In the autumn of 1852 Elizabeth died in Yeovil. By the time of the 1861 census 64-year old John had remarried and was living with his new wife Mary (b1815, Yeovil), eighteen years his junior, above his new hardware shop in Middle Street. John gave his occupation as 'Copper Smith, Tinman etc Employing 2 men and 2 boys'. In the Post Office Directory of 1866, John Mead was listed as an ironmonger of Middle Street. John Mead died in Yeovil during the autumn of 1870. Following his death, and for most of the following decade, Mary continued to run the ironmongery business under her own name (see Gallery). In the 1871 census she was listed living above the shop premises with a boarder and two domestic servant. Mary gave her occupation as an ironmonger. By 1881 Mary had retired and, on the night of the census at least, was a visitor at the home of retired tailor Job Guy and his family at Hound Street, Sherborne. Mary gave her occupation as an annuitant. Because her name was so common, it is not possible to determine when or where Mary died. The entry of John Mead's baptism in the Crewkerne parish register of 1797. The record of the 29 September 1825 baptism of John and Ann's son, Edward, from the registers of St John's church. Note that John is described as a brazier of Vicarage Street. Mary took over the hardware shop after the death of John. 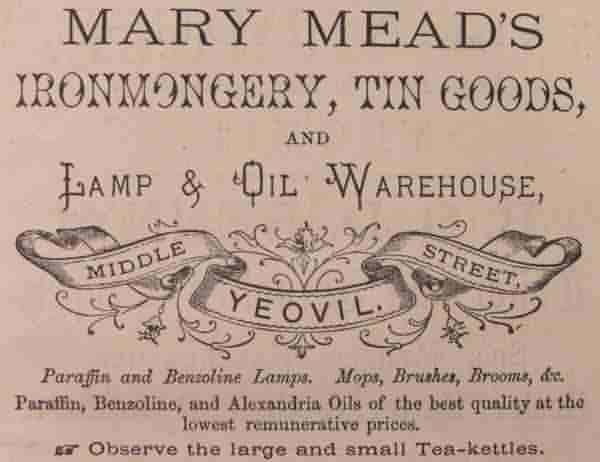 This is her advertisement in the 1878 edition of Whitby's Yeovil Almanack Advertiser.